His name means "cat" in Chinese. 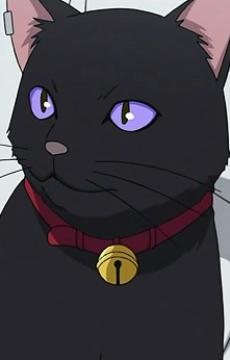 He is a Contractor who has lost his original body and now resides within that of a black cat. His messier code is HM-432. His brain is directly connected to a wireless network which enables him to send and receive information at any time, as well as subduing the natural instincts of the animals he possesses. Mao usually creates diversions for Hei in battle. Mao's ability is to possess the bodies of other animals. While he lost his remuneration along with his body, he must connect periodically with the wireless network or run the risk of having the animal's natural instincts take over. Near the end of the series, his wireless connection is cut off, eliminating his human consciousness and resulting in his 'death.' However, he had a backup network under the control of an unknown organization and he manages to reunite with Hei. It is likely that "Mao" is his codename; like Hei, his real name was never stated. He is also in hiding with Hei, residing in the body of Suou's pet squirrel Petya. Mao hates the Spring season as most cats would find a partner and try to have kittens.